Nico Nico Gakkai Beta is having a mini version of the craziest Japanese conference in Singapore! There have been four NicoNicoGakkai Beta symposiums since 2011. For the first event there was an audience of over 110,000, who left a total of over 80,000 comments. “Rapid Fire Research 100” was one of the two formats unique to this conference. In just 15 minutes, five world class researchers made 20 pitches each about their presentation. As a result, each speaker had to go though their 20~30 years worth of research in a very short time. To the audience, it was a comprehensive guide to each field as well as a motivating talk about how (initially) humble and error-prone research turns into world changing results. Masahiko INAMI is a professor at KEIO Media Design. 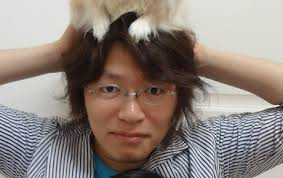 He is also directing the JST ERATO Igarashi Design Interface Project as a group leader. He received a Ph.D. from department of engineering, the University of Tokyo in March, 1999. His research interest is in Interactive Technique, Physical Media, Robotics and Entertainment Technology. He is known as the inventor of Optical Camouflage system. He received Laval Virtual Technopole Mayenne Trophee, TIME Magazine Coolest Inventions2003, IEEE Virtual Reality 2004 Best Paper Award, ICAT 2004 Best Paper Award and more. Koji Tsukada is an Associate Professor of Future University Hakodate. 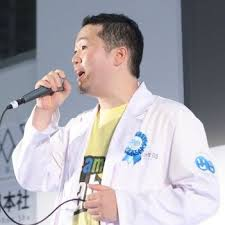 He received his Ph.D. from Keio University in 2005. 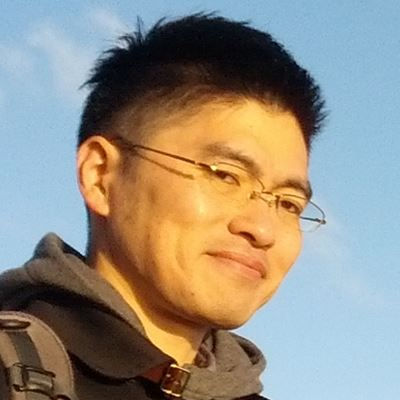 His research interests include augmented commodities, interaction techniques with novel materials, and support system for personal fabrication. He received the Ig Nobel Prize 2012 (Acoustics) for creating SpeechJammer, a machine disturbs person’s speech using delayed auditory feedback. 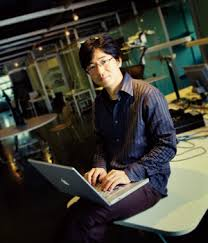 Takuya Nojima is an associate professor of the University of Electro-Communications, Tokyo, Japan. He received his BE and ME in mathematical engineering and information physics, and Dr.Eng. in advanced interdisciplinary studies from the University of Tokyo in 1998, 2000, and 2003, respectively. His research interests includes haptic (particularly proprioception and physical activity) technology, and augmented sports . Tsutomu Terada is an Associate Professor at Graduate School of Engineering, Kobe University, Japan. He received Ph.D. in Engineering from Osaka University in 2003. Dr. Terada is working on Wearable Computing, Ubiquitous Computing, and Entertainment Computing. He has applied wearable computing and sensing technologies to various stage performances and actual entertainment systems including theatrical performances. Jun Rekimoto is Professor in Interfaculty Initiative in Information Studies at the University of Tokyo and doubles up as a Deputy Director of Sony Computer Science Laboratories. His has worked in the field of Human Computer Interaction has created lasting and highly significant impact that is present in a multitude of interfaces and devices used by millions of people. His invention list includes the world first mobile augmented reality, multitouch, location sensing. He is now focusing on technologies for augmenting humans. Rekimoto strongly believes in the power of imagination as our primary drive force to create the future, and questions how our lives and this world would change if our dreams were to come true. 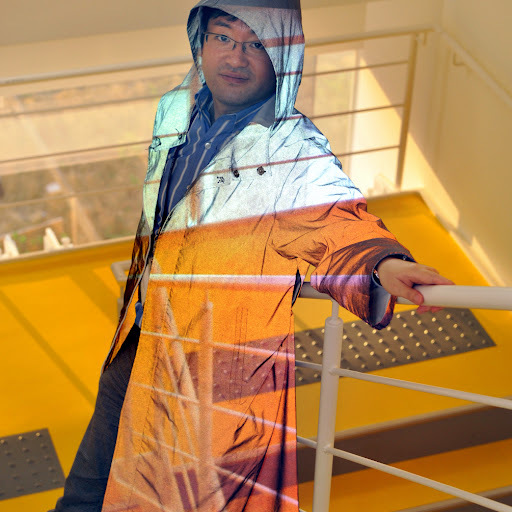 Masakazu Takasu, technical evangelist at teamLab, Committee of Maker Faire Singapore 2015, and Shenzhen 2015 takes us on a journey to his homeland of Japan and their exciting ways of using technology, design and science. TeamLab combines these disciplines to create innovative digital solutions often with physical elements of interaction. Come on down to Science Centre to learn new facts from our speakers! 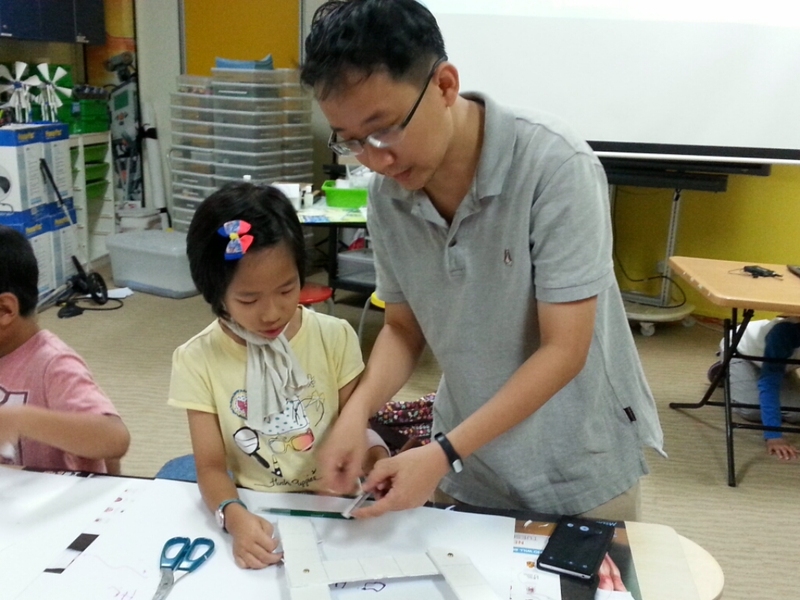 Making in Art workshop took place at Science Centre last saturday, 14th February. 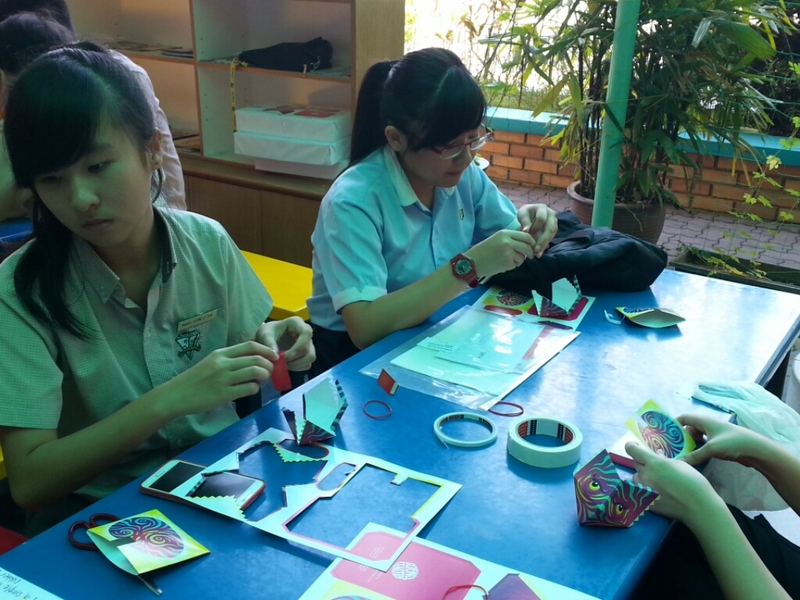 There were 8 activities – Paper Pantograph, Wood Pantograph, Paper Circuits, Junk Sculptures, Fish Bone Sculptures, Harmonograph, Polymer Clay Art and Box Cards. 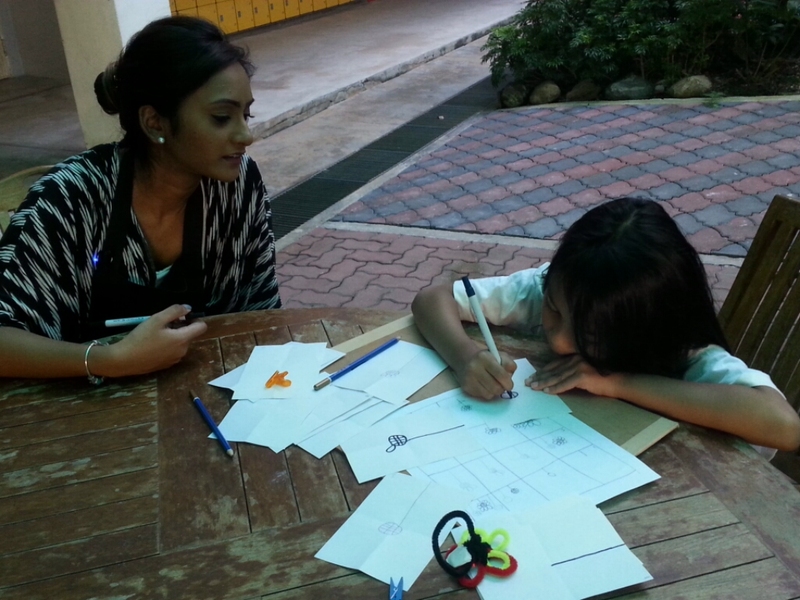 Yet again another interesting workshop where we witnessed kids being innovative. Children were not restricted by any hard and fast rules hence the sky was the limit for their creativity. 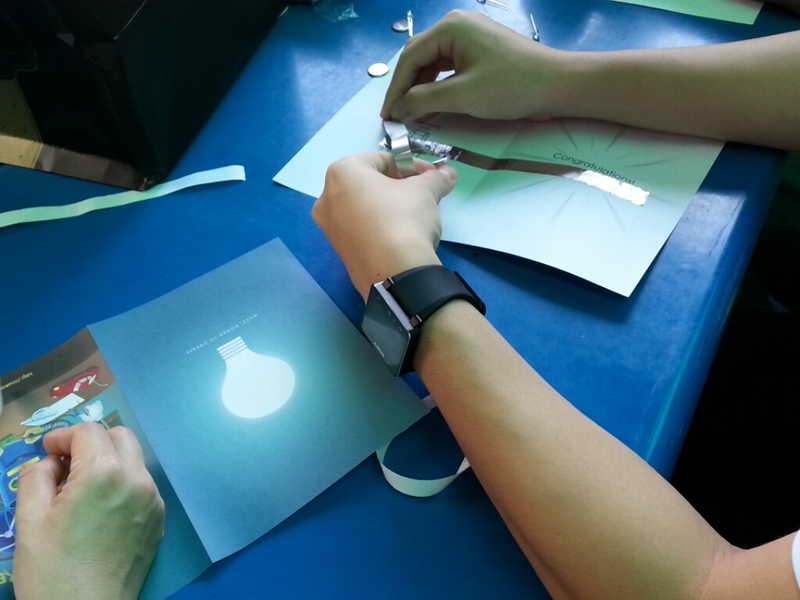 At the end of the workshop, we were pretty sure that the kids tasted the joy of learning through tinkering. 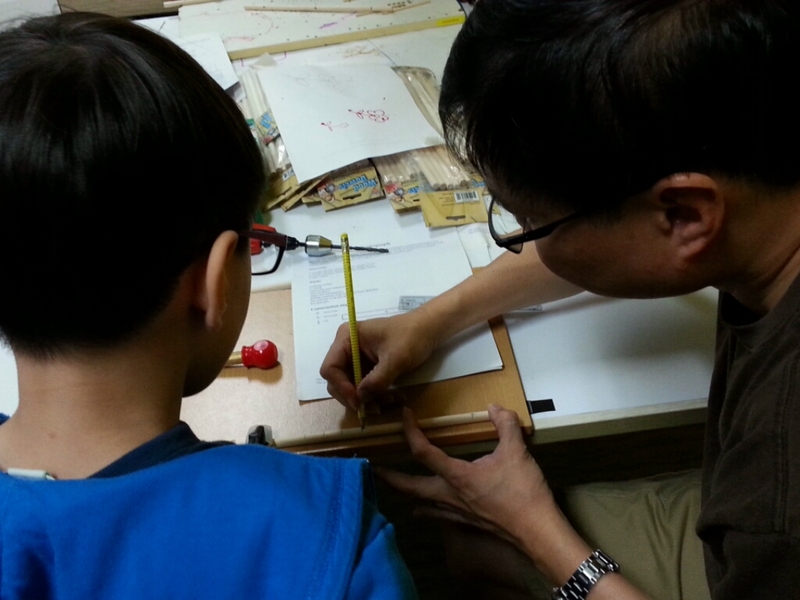 Kudos to the parents who allowed children to figure out how to Make things while guiding them instead of telling them what was right and wrong. Afterall even Edison made umpteen mistakes before inventing a light bulb. I suppose, the spirit of resilience is also nutured in the process of Making. Through such workshops parents and children work together and bond with one another. Such cool stuff made out of junk! 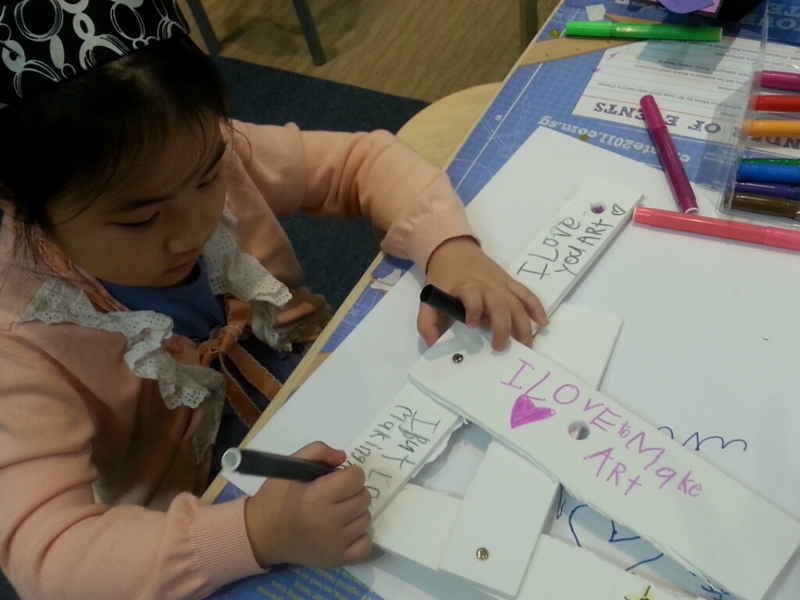 Awww, she loves Art and our workshop. This was an energy boost for us because we know that our effort is worthwhile. While I was facilitating the Junk sculptures station where children glue random junk together to form cool sculptures, a mom told me “This is very cool, I think I get to learn more than my son when I come to such workshops”. I was very happy to hear this because it is indeed a workshop for families as our title suggests where not only the kids are enlightened, but also their parents. 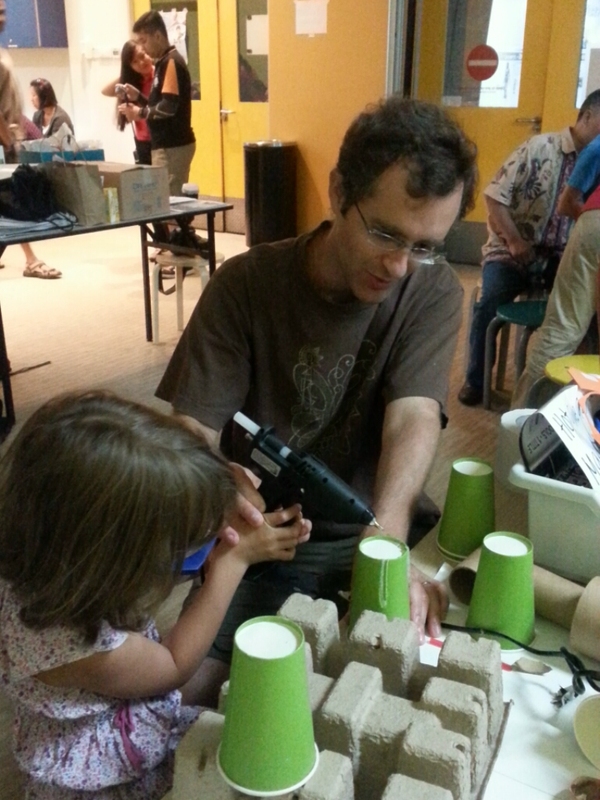 There was a significant number of kids who were asking me where to buy the hot glue gun and how much it costs. Many commented in the feedback forms that they would like to know where to purchase the raw materials. This goes on to show that they would probably go home and Make as well. It is very heart warming to hear such things. Children are so passionate about Making and they take ownership of what they make. A child named Morgan explained to me how the castle he made works and the unique features which it contained. Another kid, Sophia, was telling me how she made her the polymer clay bear. 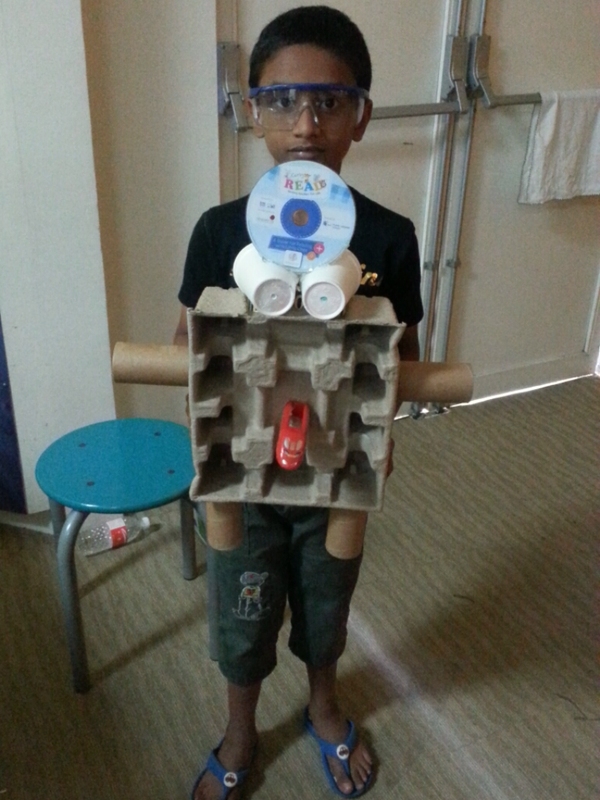 There is so much satisfaction and pride when the children talk about what they Make. 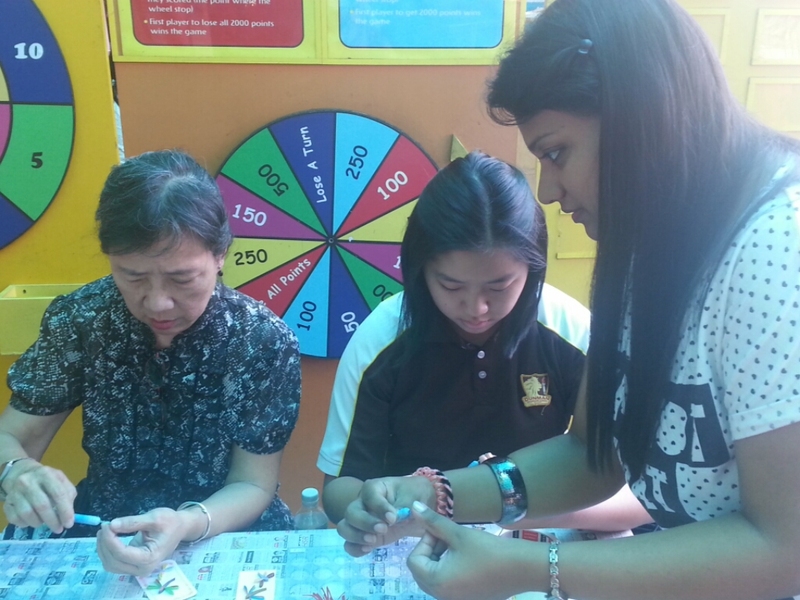 Our partner, Tampines Central Community Club is organising Play @ Tampines on 14 March 2015 at the Open Plaza Tampines Mall (rooftop) from 11am to 3pm. 1. Who are the target audience? Chideren aged 6 to 12, about 500 to 700 pax. 2. What kind of booths are expected – showcase or hands on? We would like hands-on activities. 3. Indoor or Outdoor activities? We have both outdoor and indoor (a small space). 5. Will Makers be able to sell items?